Do you want to learn how to paint furniture using the best products we’ve ever used? We can teach you how to paint, distress, top coat, and glaze furniture using our highly-recommended specialty paints and products. The class is $65 (plus tax) per person and lasts about an hour and a half to two hours. If you are interested, read below for dates and registration information. If you would like to register for a listed class, stop by the store to fill out a form and make your payment. If you can’t make it to any of the listed dates but would like to be notified of future classes, call the store and leave your name and number. We will then send out courtesy phone calls or text messages informing you on upcoming dates. All classes are scheduled on either Tuesday or Thursday evenings. Have a big group? We also book private parties for 8-10 people. If one of our available dates works for you and you would like to attend, just call or come by the store, fill out our registration form, and pay for the class in full. We only have enough room for 10 people and our spaces usual fill quickly, so make sure you don’t put registering off for too long! The $65 plus tax registration payment must be paid and form signed in order to reserve a spot in the class. The price covers registration, paint, supplies, and light snacks. We will also offer 10% off our paint products on the night of the class. Students will need to bring a small piece of furniture no larger than 22 x 22 x 32 inches. Paint colors must be chosen within two weeks of the workshop date. If they are not chosen by then, we won’t have enough time to make a special order and cannot guarantee that certain colors will be available. All participants need to arrive no later than 5:50 so we can get everyone set up and lock our doors right at 6. If a student is late, we cannot guarantee that we will be able to hear them knock on the door, as we will be working with everyone in the back workroom. The students are responsible for remembering the date and time of the class. A cancellation or failure to show up cannot be refunded or exchanged for a future class or be used as a registration payment for another person, unless inclement weather or an emergency occurs. Each piece must be prepped before arriving to the class. We recommend a light sanding using 220 grit sanding material. The furniture can then be cleaned with 50/50 vinegar and water or Windex. If the piece has any build-up, use 50/50 denatured alcohol and water. When painting with any shade of white or a pale color, primer is recommended. Since our paints are not washable, please dress accordingly. All projects must be taken home that night. We suggest bringing something to protect your vehicle’s interior from any wet paint. The price of our paint workshops includes one small container of paint in your choice of color. 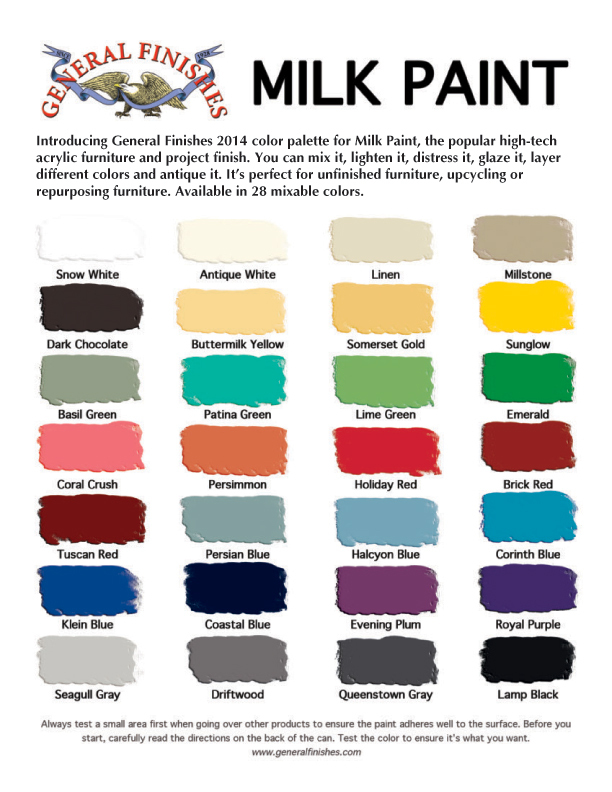 You can choose between our three brands: General Finishes, Faux Real, and Miss Lillian’s. Because the colors in these pictures aren’t all completely true to color, we recommend that you come in the store to see them in person before making your final decision. We may also have new colors in stock that aren’t on the color charts.